“A picture is worth a thousand words” is an English language-idiom. It refers to the notion that a complex idea can be conveyed with just a single still image or that an image of a subject conveys its meaning or essence more effectively than a description does. 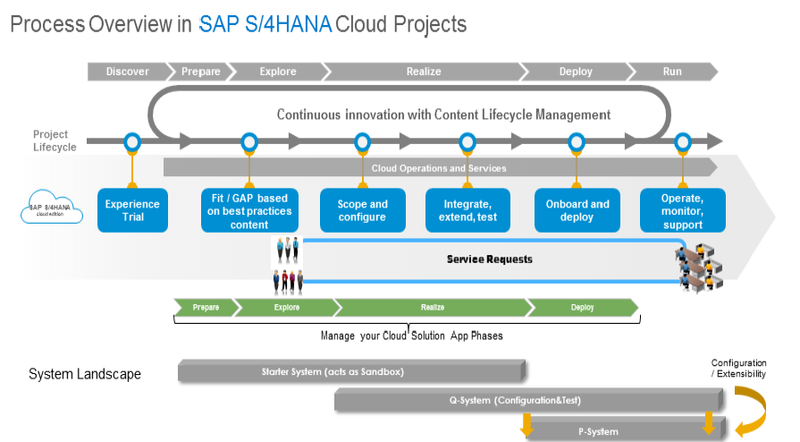 I saw this picture and found everything regarding to SAP S/4 HANA Cloud is available in this single picture and that’s how I concluded the title ‘A picture is worth a thousand words – SAP S/4 HANA Cloud’ for this blog/article. Let’s get started. 5. System Landscape: There are three systems (Starter, Quality, & Production) in S/4 HANA Cloud Edition in totality but only two systems can be kept active at a time. Note: If you need a separate system in S/4 HANA Cloud in between phase A or B; a request can be raised with SAP and SAP can help you with additional client within Quality System but no separate independent system will be provided. And it comes with an additional cost. Transport Management: Configuration is done on Quality Systems and transport requests are moved to production system. No TR is moved from Starter system to QAS or to Production.